Join the JCC teens as we head outside and enjoy all the fun that Southern California has to offer! These programs provide opportunities for teens to maintain a healthy and active lifestyle! Meet other Jewish teens at these fun and safe events. Dance the night away at our CLUB J or rock out with our first Battle of the Bands. Bring a team to one of our Teen Tournaments or get community service hours helping the community. Every event sponsored by the Lawrence Family JCC Teen Department is sure to be a good time! 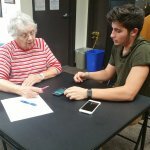 This is a great opportunity for teens to meet with older folks and help them with technology while gaining community service hours! In partnership with the Seniors Department, teens will help explain things like Facebook, email, SKYPE, Google Photos and more! Participants will make a wonderful difference in the lives of these older folks and maybe even learn a thing or two themselves. For more information and to sign up, please contact the Teen Department. Since 2014, the Like Israel Project has been putting on impactful and meaningful events for all San Diego teen to help foster a positive relationship with Israel and Judaism in general. Presented by the JCC and Youth Action Movement, along with many community partners, the Like Israel coalition (both educators and teens) create a new and relevant way to show teens all sides of Israel and in turn deepen their understanding, education and connection to Israel. 2014: Featuring Izzy Ezagui - a true lone-Israeli soldier and overcoming life changing obstacles. 2014 part 2: Featuring iTalks - the immense contributions Israel has made to the world. 2016: Featuring Artists 4 Israel - exploring Israel in through the five senses to reinforce the message of peace. 2017: Featuring YouTuber Ami Horowitz - educating and developing critical thought by diving beneath the surface of the Arab-Israeli conflict. Make sure to come to the next Like Israel Project! If you are interested in being a part of this year's Like Israel committee and help create the next event, please reach out to the Teen Department. More Info!